Relief from inflammation, swelling & joint pain! Prefer to avoid drugs, steroids or undergo painful & invasive procedures? The OSMO Patch used in combination with adequate rest provides support to reduce inflammation, swelling and the associated pain due to bursitis, baker’s cysts, tendonitis, carpel tunnel as well as many other similar joint and muscular inflammatory conditions. Whether you are looking to support your current treatment regime or just wishing to try and avoid invasive surgery, painful drainage syringes, cortisone shots and damaging anti-inflammation medications, then the OSMO Patch just may be the answer you have been searching for.. The OSMO Patch Contains NO anti-inflammatory Medications. Anti-inflammatory medications such as NSAIDs may cause gastrointestinal irritation and bleeding in some individuals. A syringe will often be used to aspirate fluid from injuries such as bursitis and baker's cysts & can be extremely painful. The OSMO Patch contains NO steroids. Cortisone shots can be very painful, expensive and may also result in several possible adverse side effects or complications. Invasive surgery... your absolute last option! Surgery is invasive and should always be avoided if possible. The risk of complication verses the likelihood of success should always be considered. Bursitis can often be difficult to treat. This video explains how the OSMO Patch is effectively able to naturally reduce swelling &pain associated with bursitis. The OSMO Patch is ideal for most types of bursitis. This includes conditions such as elbow bursitis, knee bursitis, shoulder bursitis, hip bursitis, wrist bursitis, ankle bursitis and bursitis in the foot. Discover exactly why & how the OSMO Patch is ideal for relief from bursitis. Learn why the OSMO Patch is the perfect solution for a Baker’s cyst. For a more comprehensive understanding of exactly how the OSMO Patch works. Real people ... Real results! 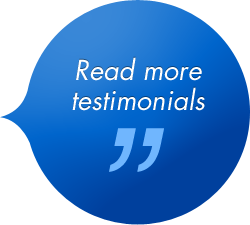 Here are just a few of the wonderful testimonials we have received.